As of this Wednesday, homeowners relying on expensive oil central heating in their homes will be offered payments of thousands of pounds to switch to renewable energy alternatives. This scheme is part of a government incentive to dramatically reduce carbon emissions in the UK. Around 18,000 households have already installed the technologies in recent years and will be eligible to start receiving the payments. Andy Boroughs, managing director of Welshpool-based renewable heating company Organic Energy, today said: “This is fantastic news for UK homeowners who have long struggled with rising traditional fuel bills but needed to see commitment from the Government to an incentive before taking the next step. “For those domestic properties which are off gas-grid, with LPG and oil prices continuing to increase, the proposed tariff levels make a wood pellet boilers and other renewable heat systems an attractive choice for consumers as well as helping to reduce carbon dioxide emissions in the UK. “The non-domestic scheme has been incredibly popular, and now our domestic customers will also be able to access a quarterly payment, both for those installing renewable technologies in the coming months and those who have installed an eligible system since 2009. 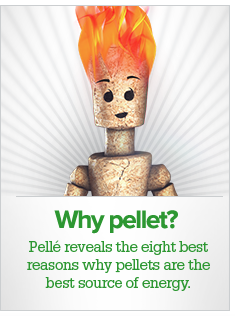 “We anticipate that the amount of estimated incentive our customers who have installed a wood pellet boiler will receive over a one year period ranges from £1,874 for an 8KW boiler to £10,540 for our larger 45KW systems. “However, we are keen to see that the domestic scheme does not experience the hold-ups which were significant in the early stages of the non-domestic RHI scheme. Organic Energy is the UK's sole distributor of European leading biomass boiler brand, OkoFEN.